Nancy and Monkey. Not dangerous at all. Allow us to introduce ourselves: we’re two supposed adults who love the same things you do. What, you don’t believe us? Well, Nancy is endlessly entertained by burping, and Karen has been known to eat ice cream out of the carton for dinner. So you be the judge. Do we sound like certified grown-ups to you? Here’s something else we both love: children’s books. And we want to share our favorites with you. But not because reading is good for you, as surely your teacher has told you. No offense to your teacher, but a good book goes way beyond that; it consumes and entertains you in a way that nothing else can — not even Taylor Swift’s Instagram (although we must admit, that comes a close second). 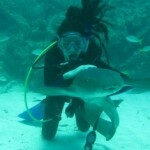 Karen and a Nurse Shark. Slightly dangerous. So welcome to Kidsmomo! Tune in to our videos and podcasts, read about what’s up in the world of children’s books, and find out which books other kids are recommending. Plus contribute your own thoughts and book reviews. Just don’t tell the government that we refuse to grow up — they let us vote and buy lottery tickets and everything. Nancy and Karen, thanks sooooo much for including a review of BOBBY VS. GIRLS (ACCIDENTALLY) on your podcasts! I’m here! Thanks for reviewing my book, BAMBOO PEOPLE! I WANT TO READ THE BAMBOO PEOPLE NOW!! We should have a place on Kidsmomo called, “Author Visitations.” We’re starting to build up a very small resume of authors who have acknowledged Kidsmomo’s existence. It’s a kind of crazy-impressive short list, too. Hey, thanks for the GREAT review and for recommending my book THREE TIMES LUCKY! I’m so glad you like it! Hey! I am reading that book! It is wonderful so far, and in so many ways. O-O Forget the whole “friend ” thing. I just noticed you 2 were adults……… Btw Nancy stil… RAINBOW MONKEYS! !